We love our dogs and we treat them like a family member. Hence we want them be taken care of from eating to drinking, from pooping to swimming, from wearing to training. Here is our today’s topic – 15 Useful and Innovative Dog Gadgets. It is time to gadget your dog! No more empty or dirty water bowls! Make sure your dog drinks only fresh, clean water. 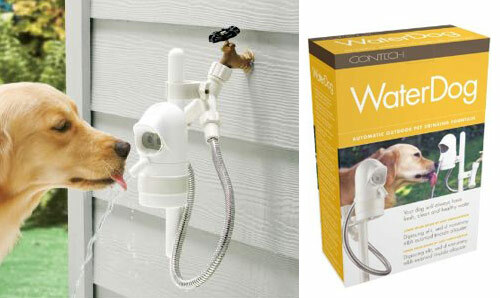 As soon as your dog approaches the WaterDog, it dispenses a stream of fresh, cool water. When your dog leaves, the water turns off automatically. You’ll never have to worry about what your dog has been drinking again! For a healthier, happier dog – and for your own piece of mind – choose the WaterDog! Ensure that pets (and other backyard critters) have a safe way out of a pool. 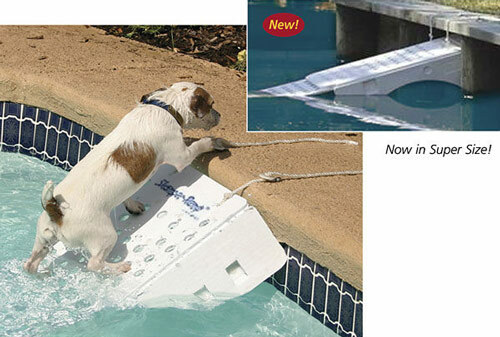 An easy-to-install life-saving ramp for animals, high-tech corrugated plastic attaches to the side of a pool (including vinyl-lined), walled pond, dock or boat. Deck hardware included. Tired of searching for your hunting dog in tall grass or dense cover? Now you can leave the hunting entirely to him. Introducing Astro, the first high sensitivity GPS enabled dog tracking system for hunters and sportsmen. This unique system pinpoints your dogs position and shows you exactly where he is, even when you can’t see or hear him. 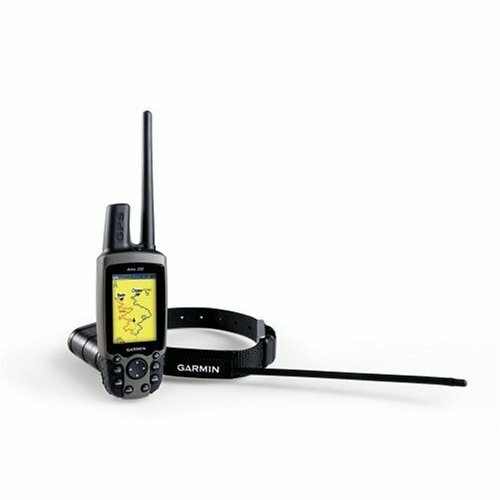 The Astro system includes a bright color screen hand-held GPS device and the rugged, all weather DC 30 collar. The collar has an integrated GPS transmitter and is specially weighted so the antenna will always point to the sky for optimum signal. To get started, just take Astro outdoors and turn on the hand-held and transmitter to acquire GPS satellite signals. Then attach the DC 30 to your dog. Now you are ready to turn him loose / no other setup required. You can track up to ten dogs at one time with Astro, at a distance of up to seven miles away /depending on terrain/. One of the down sides of having a pet is that it’s a whole lot harder to ditch town for a week without having a friendly neighbor that you know and trust. It’s a better option than just dumping extra food in a dish if you want to regulate how much they eat per day. 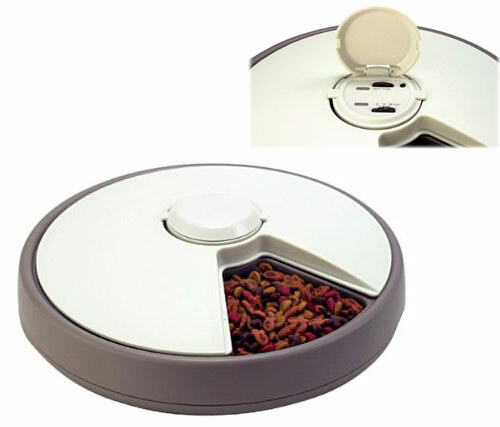 The 6-day pet dish has an accurate timer and if there happens to be resistance on the feeder it will stop the lid rotation. That way if your pet happens to be finishing up it won’t catch their paw in the dish somehow. It can feed the animal in intervals of 6, 12 or 24 hours. Each compartment can hold about 2/3 cup of dry food, so it’s best for a smaller animal. 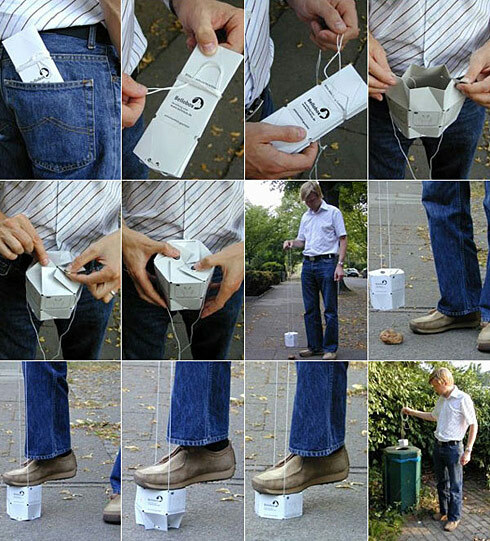 The P@W (Pet At Work) is an ingenious solution for those of you who enjoy taking your small pet with you to work, traveling or visiting friends and family. 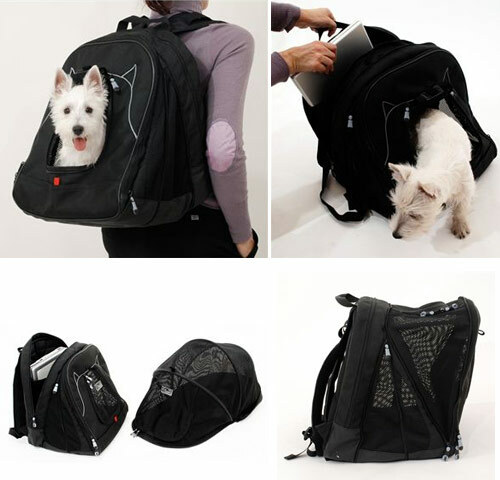 Not only can your pet be carried safely in the back-pack carrier, but there is also room for your laptop and the portable dog house. The P@W features a wonderful foldable Pet Dome, a perfect soft crate so that your pet can enjoy the security of home while at your office or anywhere that you wish to take him. 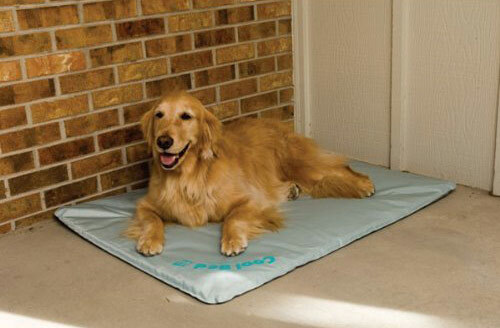 the Pet Dome comes with a soft double sided comfort mat. Pet Dome and cushion come with the P@W but additional ones can be ordered separately. The P@W is expandable from compact, to standard, to expanded, its dimensions are (W)15″X16″(H) both fixed dimensions, and depth 9″, 13″ or 16″ when fully expanded. The Bellobox is a German biodegradable invention that enables cleaning up behind your pet without having to touch the excrement or bedding down. Cool off your dog for safe summertime outdoor fun. Protect your active dog from the dangers of heat exhaustion. Simply wet a Cool Vest and put it on your pet. As the water evaporates, it helps regulate your dog’s temperature to prevent heat-related injury. Light and thin, but tough, material stands up to hard wear–and is chemical-free for complete safety. The waterproof lining means there no wet-fur smell. We’re now keeping pets cooler than ever with the new, Cool Bed III. No electricity is required to operate the Cool bed III and these beds are attractively designed and allow a cool spot for dogs. Simply add the recommended amount of water through the easy fill cap and burp with the new easy air adjustment valve. Our unique Cool Core diverts the liquid better than ever throughout the bed for advanced cooling power. The new nylon/vinyl exterior is tougher than ever!! Being extremely affordable, the Cool bed III is the choice for any dog owner looking to offer their pet a comfy, dry, cool place to relax. Recommended for indoor and outdoor use. Bring your pet along for the ride wherever you need to go. The Outward Hound Back Seat Hammock stretches across the front and rear seats of your automobile. It keeps hair and mess of the seats and gives your pet a fun, comfortable, safe ride. Easy to install in seconds. Does your dog miss you when you’re away? Now it can hear your voice any time it wants with the ChatterBowl® talking pet bowl from Contech. The ChatterBowl is a high-quality food bowl that records your voice, and plays it back when your pet approaches. Just record your message (up to 10 seconds) and your voice will play whenever your pet comes to eat or drink. 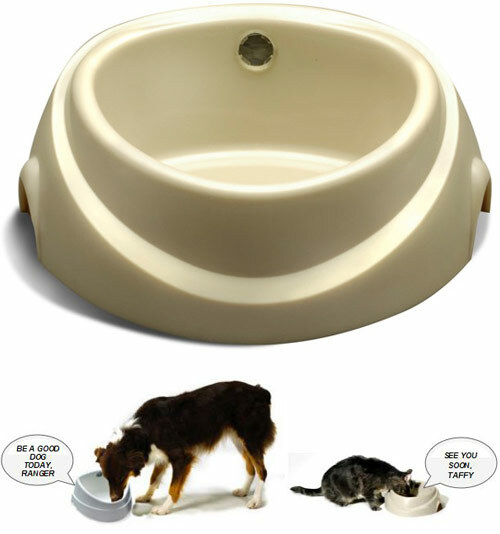 Ideal for free feeding or as a water dish, the ChatterBowl helps keep your best friend company, even when you’re away from home. DogTread by PetZen. Exercise anytime, anywhere, any weather. Establish a Regular Exercise Routine for your Best Friend. 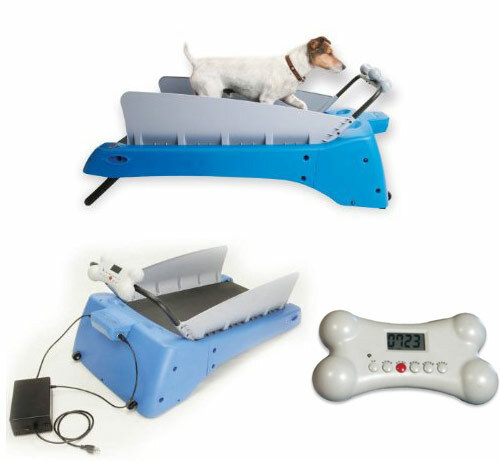 Treadmill training can give a dog a great workout regardless of weather or environment, allowing owners to maintain a consistent exercise regimen. It provides increased muscle definition, toning, improves vitality, increases life span and can help curb destructive behavior or excess energy often associated with the lack of regular exercise. Keeping your pet healthy is a key ingredient to a happy pet. Patents Pending. A company called ‘Friends FIR Life’ (I kid you not) has developed a device called the Fauna Sauna which will keep the warmth flowing all day and night. Instead of using light to produce the heat the sauna uses infrared rays to directly heat only the object (your dog or cat) lying directly in front of the device. There are apparently many health benefits to infrared heat too but the biggest advantage is that the harmful rays of the sun that can cause burns and other nasty side effects are avoided. 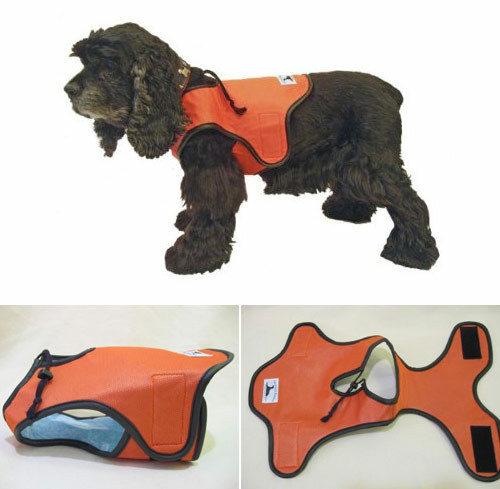 Those of us who see our dogs and cats as more than just a pet, but rather, a family member instead, will find that the Therapy Pet Jacket is one nifty device to purchase for Fido. After all, this cozy and fleecy therapy jacket is reversible and can be made hot or cold depending on the situation at hand. 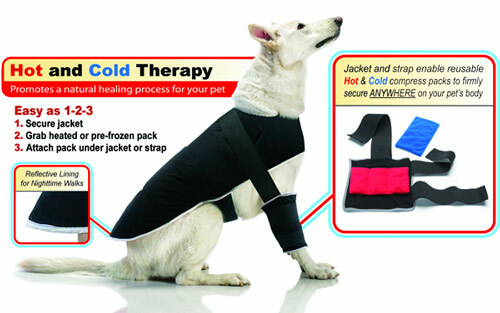 It works great for pets in situations such as suffering from an injury, a muscle pain, hip dysplasia, or even arthritis. Apart from that, it can also be used to treat a plethora of ailments such as tendonitis, bursitis, ligament injuries, spinal disorders, post-op rehabilitation and injury recoveries. 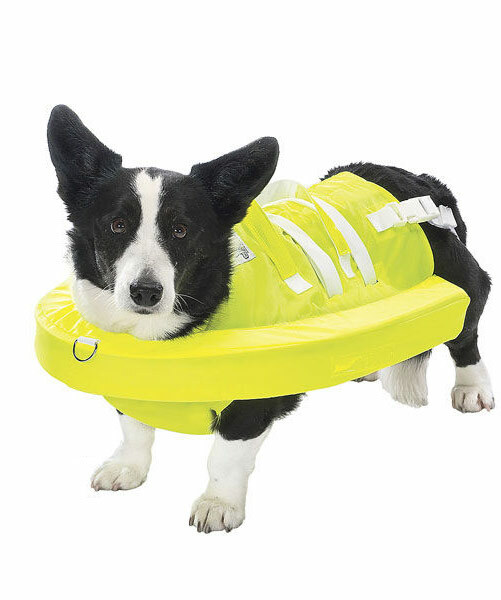 Keep your dog safe and calm in the water with this unique new flotation device. The innovative patented design features lateral stabilization, preventing dangerous rollover in smaller breeds and allaying fears in water-timid dogs. Perfect for boating, swimming and hydrotherapy. Durable ripstop nylon with Ethafoam™ insert, hook-and-loop closures and lift handles. Adjustable neck opening. Considered more humane but just as effective as other training methods, this patented collar controls a dog’s excessive barking with a harmless mist. A spray unit attached to the collar has a built-in microphone that triggers a startling non-toxic spray each time your dog barks. 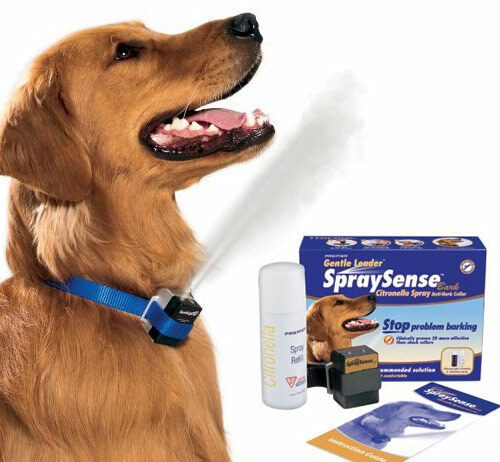 The canine quickly associates the spray with its behavior, causing him to curtail his nuisance barking whenever he wears this collar. The unscented water-based solution is hypoallergenic and ozone friendly. The collar’s reservoir holds 25 applications and it comes with a 300-application refill. The included three-volt battery lasts up to four weeks.